Stylists use several tools to cut hair: scissors, razors, thinning shears and clippers. Each tool creates a different texture in the hair, affecting how the hair looks after it is styled. The type of tool used may even determine how the hair is styled. For example, razored styles are often finger styled or straightened because curling these cuts is difficult due to the jagged edges the razor creates. Shears, or scissors, and razors are two of the most common tools used by stylists. Shears vary little from style to style. The main difference between shears involves the length of the blade. Blade lengths range from 3 to 5 ½ inches. Each set of professional hair-cutting shears has a sharpened cutting blade, a stationary blade and a finger rest. Razors vary in style. Some styles open up like an “L” with the razor on one end and the grip, or handle, on the other end. Some resemble combs with a razor embedded deep among the teeth of the comb. The proper use of hair-cutting shears involves holding the shears in the dominant hand with the thumb and ring finger through the holes on the handle. The pinky finger rests on the finger rest, and the thumb moves the cutting blade to remove hair. Razor cutting involves holding the instrument lightly in the hand and removing hair with delicate movements of the fingers and wrist. The angle at which the razor is held against the hair determines how much hair is removed with each movement. Although some cuts are completed using one tool or the other, most modern cuts are created using a combination of the two tools. In a hybrid cut, stylists use shears to create the basic shape of the cut. They then add interest, texture or thin select sections of the hair with the razor. Razor cuts can cause some hair types to appear frizzy on the ends. 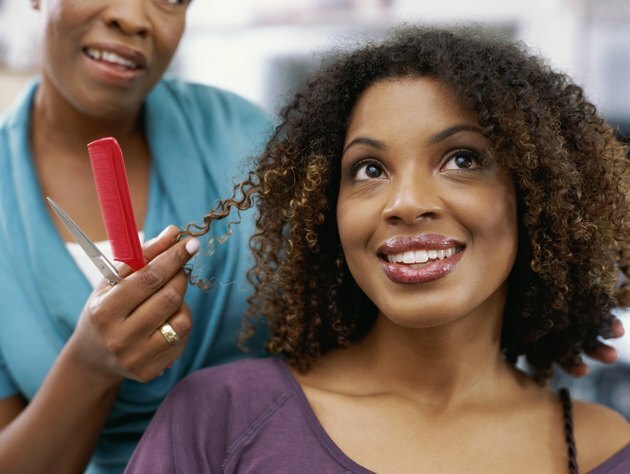 Naturally curly or frizzy hair may not do well with razor cutting. Ideal candidates for razor cutting include people with fine, straight, softly curled and medium-textured hair. In addition, a person should not razor any hair that she wishes to have permed, as the jagged edges make it difficult to roll the hair around the perm rods. Milady's Standard Textbook of Cosmetology; Milady, et al.